School Dance Dress – Oh Sew Kat! Is it too soon? 🙂 Have you thought about the special girls in your life that might enjoy new clothes for their special dolls this holiday season? Here are a few ideas to inspire you to ring in the season! Click on each photo to go right to the Oh Sew kat! sewing pattern I used. 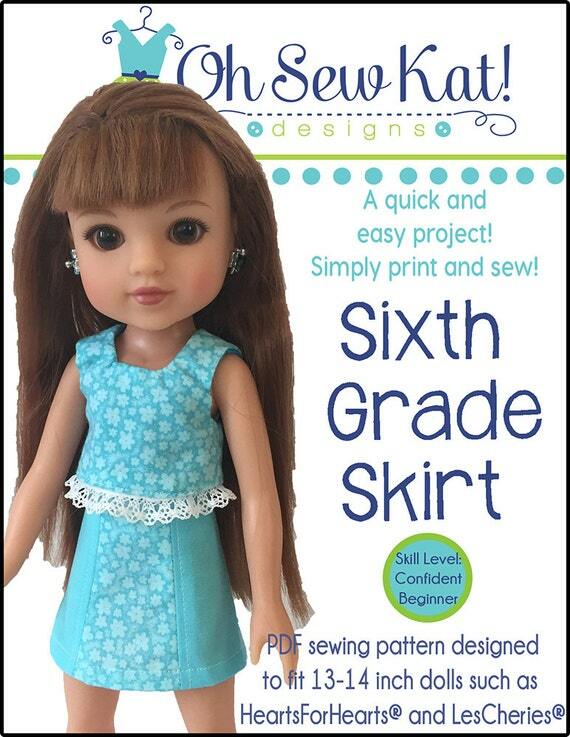 Visit my Etsy Shop to find a full selection of patterns for dolls from 14-18 inches tall. Four Season Skirts ^^ Find this free pattern HERE. See more holiday doll clothes ideas HERE and HERE. It’s time to head back to class!! 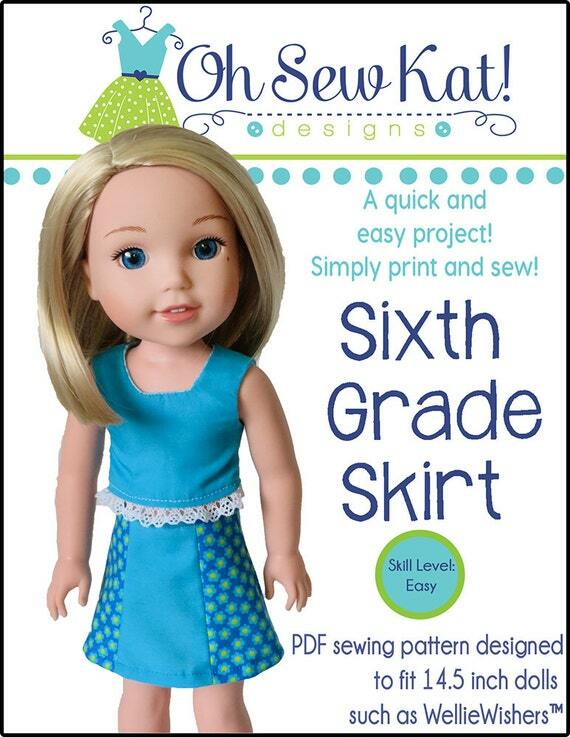 Your dolls will be ready for the 1st bell in a cute SCHOOL DANCE dress you sew yourself with this easy sewing pattern with lots of options! Find the pattern sized for 18 inch dolls HERE and for 16 inch dolls like Disney Animators HERE. It’s also available for 14.5 inch Wellie Wishers. Use this School Dance pattern to make a groovy dress for 70s BeForever character, Julie Albright. See more ideas for Julie HERE. Are your dolls ready to head back to school? Find more sewing inspiration in the Inspiration Gallery, sorted by pattern and by character. Back To School with Oh Sew Kat! The most wonderful time of the year! Get your dolls ready to head back to school in style. Willa and Camille are dressed in Simple, Sweet Tees with Four Season Skirt. Both of these patterns are so quick and easy, you can outfit the whole bunch in just one afternoon. The Four Season Skirt pattern is FREE right here. Kelly’s dress was made with the School Dance Dress Pattern. 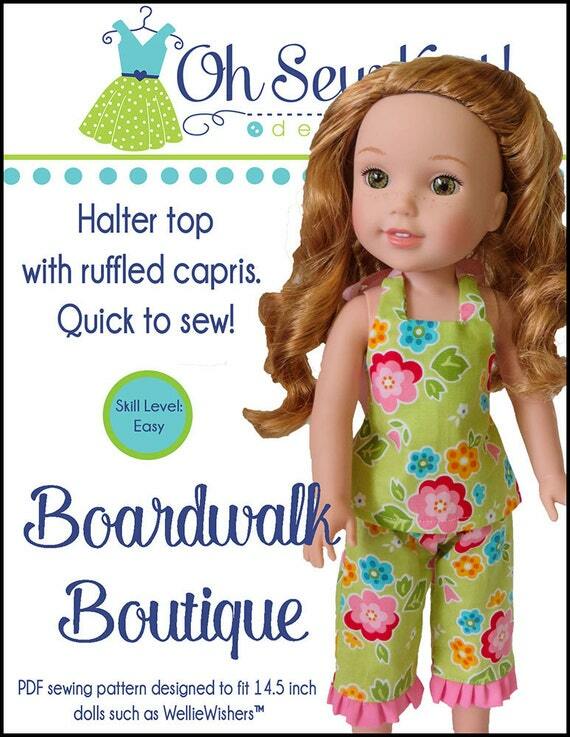 With three different ways to sew it up, your doll will be ready for cooler weather in her own style! Grace is comfy and casual in her Simple, Sweet Tee and boots. Are your kiddos ready to head back to school? Their doll friends will be with these cute outfits you made yourself!! See more Simple Sweet Tee Ideas here and here, and the Four Season Skirt is here. Thank you to Jenny who sent me these photos of the doll clothes she made for her daughter, Freya, for Christmas. Freya is a lucky little girl and has some of the best dressed dolls this holiday season! *Affiliate Links. Here the wellie wishers and glitter girls sized dolls are looking great in their Sugar n Spice Dresses. I just love these School Dance Dresses!! The contrasting panel gives a fun twist and each ribbon belt can be tied in the front or the back. 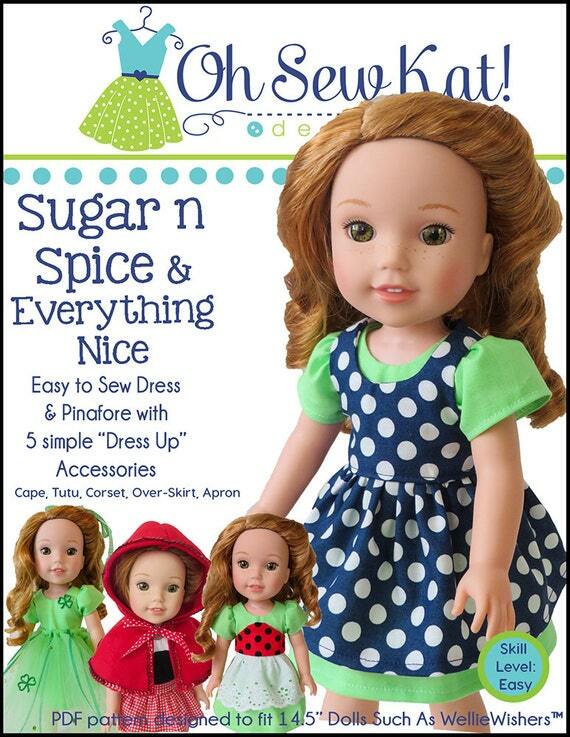 This Glitter Girls Doll (made by Our Generation) looks so lovely in her Sugar n Spice Dress! All the Oh Sew Kat! 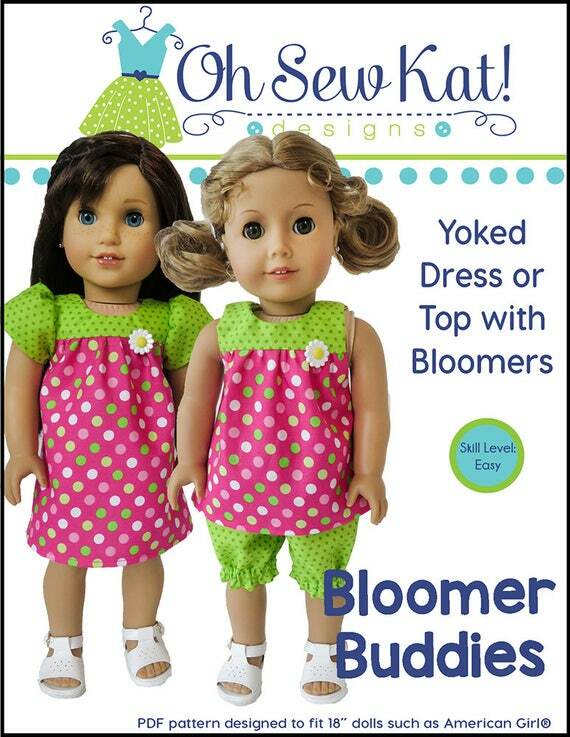 wellie wishers patterns fit these new dolls as well! Find both of these patterns, and many more, in my Etsy Shop, and also at http://www.youcanmakethis.com and www.pixiefaire.com. Whether you are making a gift for a special girl in your life, or teaching a young girl to sew her own doll clothes, so many of us get inspired and excited by festive holiday prints and trims! First up is Nanea in (Tenney’s Shirt) and a Four Season Skirt. Here are some of my favorite doll outfits I’ve sewn for the holiday season. Lanie in Playground Pants and Jumping Jack turtleneck. Willa in a sweet Party Time Peasant Dress. Always a classic: Emily in a School Dance Dress. Mary in another School Dance Dress. 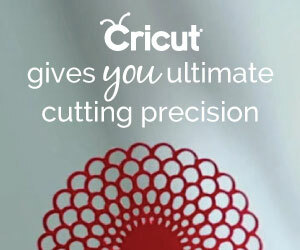 What are you sewing this holiday season! Don’t forget to share! Mmm! Can you smell it in the air? Yep! That is pumpkin spice you smell. It’s time! Fall is here! Everyone is gearing up for trick or treat on Halloween, even the dolls! Make a few decorations for your dollhouse for the season so they can celebrate Halloween in style. Kelly loves her pretty Halloween decorations, made from a few item from the local craft store. 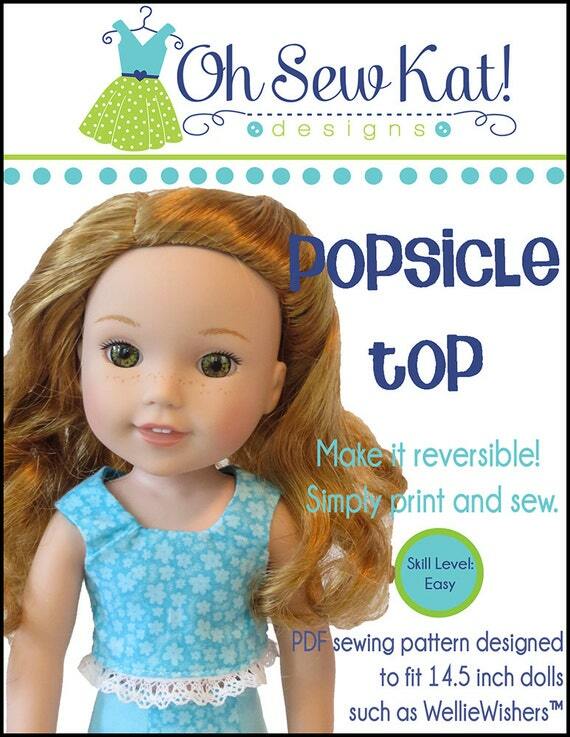 Here are some easy projects to try for your doll! Is it past Halloween when you are reading this? No worries, you can make them for other seasons too! This post has affiliate links. To see the tutorial and find the pattern pieces for the cute, little Spooky Bat, see page 22 of the October issue of iCreate Monthly. Find out more HERE (and be sure to join in all of the fun this month on this new website, JUST for doll lovers with DollTober Fest). If you have not seen this magazine (online or in a glorious print issue each month!) I highly encourage you to check it out. 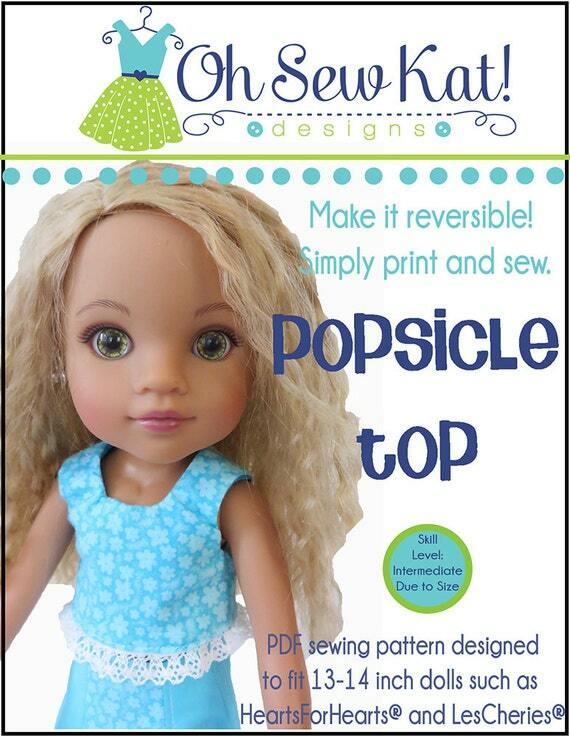 If you are looking for a gift of patterns, crafts, and more for dolls, take a look at iCreate Monthly. You can also join the community for free, or pay a little to get even more features. Oh Sew Kat! is a proud sponsor of “DOLLTOBERFEST” and if you complete the pumpkin challenge, you will get a valuable reward (hint hint!). Boo Blocks: These are so easy to make for any season! I purchased a bag of one inch blocks at the craft store, just like these. I used a one inch square punch (but you can use a paper cutter or ruler too) and cut squares from different scrapbook papers. I mixed and matched prints and solids and drew pumpkin faces on the orange ones. With sticker letters, I spelled out BOO! Stack them up to make a cute tabletop decoration! Washi Tape Flag Banner: Who doesn’t love washi tape? In so many colors, and so many patterns, it’s hard not to collect a whole drawer full of the cute little rolls! Pull out your favorites, and some thick twine or yard, and create a super quick, super easy decoration for your doll’s Halloween party. Add a few pumpkins or hats from the craft store, and you’ve set up a quick and easy, festive Halloween Party for your dolls! Kelly and Melody’s dresses were made using the Ghouls and Goodies fabric from Riley Black and the SCHOOL DANCE DRESS pattern from Oh Sew Kat! These girls are ready for some pumpkin spice lattes! Join the doll fun at a new website just for dolls! www.icreatefordolls.com. 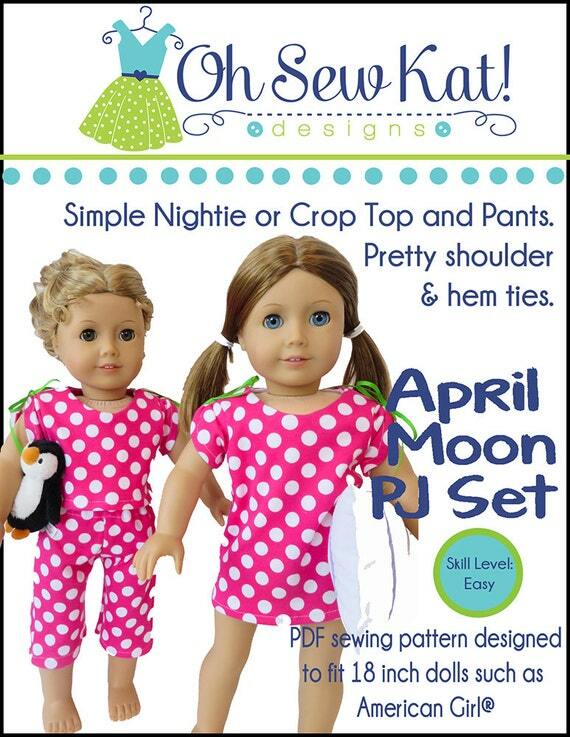 Sew doll clothes for Halloween! It’s the spooky season! I’m obsessed with this adorable Halloween fabric from Doodlebug. I couldn’t wait to make it into a few cute doll dresses for my Wellie Wishers dolls! I used the School Dance Dress pattern and had fun mixing and matching the cute, spooky fabrics! The eyes are just too much! Owls and black cats, oh my! 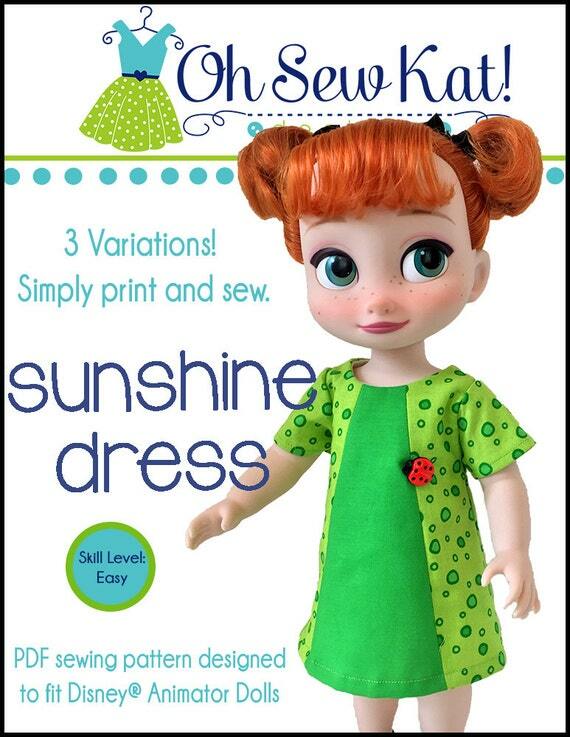 The pattern is available in three sizes: 18 inch dolls, Wellie Wishers, and for 16 inch Disney Animators. Willa loves her new dress! I used a little scrapbook embellishment for the ribbon’s belt buckle. Camille loves to twirl. 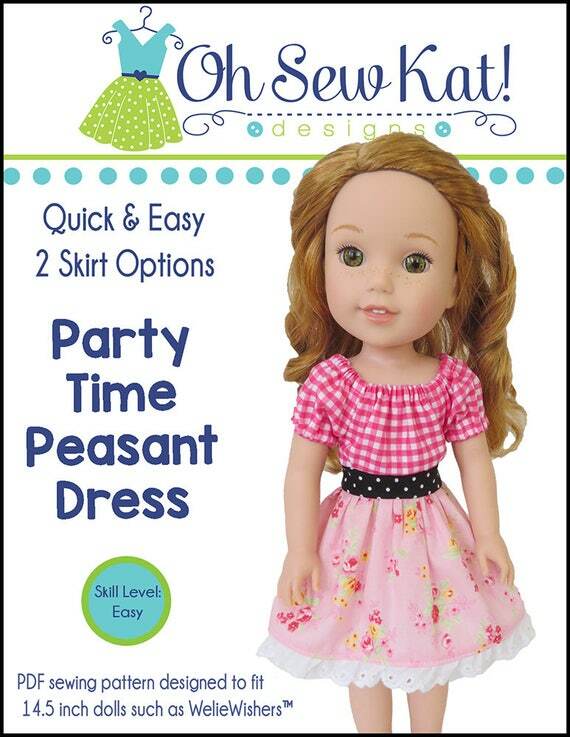 Her dress is made with the Party Time Peasant Dress. 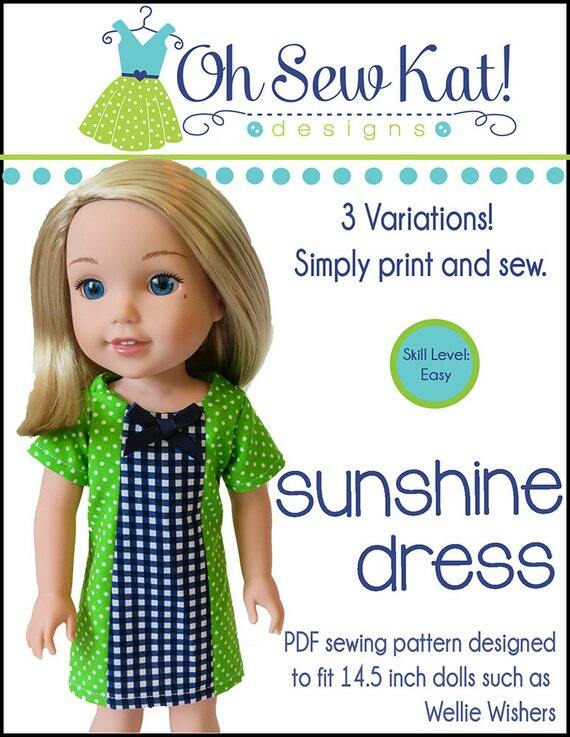 This doll dress pattern is available in 5 doll sizes: 18 inch dolls like American Girl dolls, 15 inch baby dolls like Bitty Baby, 16 inch dolls like A Girl for All Time and Disney Animators, and of course, 14.5 inch Wellie Wishers. Find them all in my Etsy shop including a special bundle for 18 and 14.5 inch sizes. I used some cute, striped bias tape from HOME SEW on the bottom. It was perfect! I can’t get enough of this fabric! It’s called Ghouls and Goodies by Riley Blake. (Doodlebug Designs). Such cuteness! 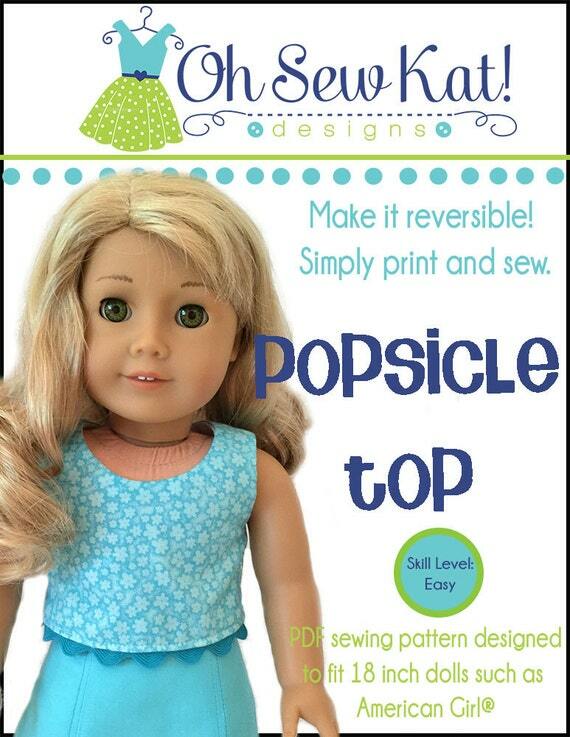 Are you sewing for your dolls this Halloween? Tester Tuesday: School Dance Dress for Wellie Wishers. 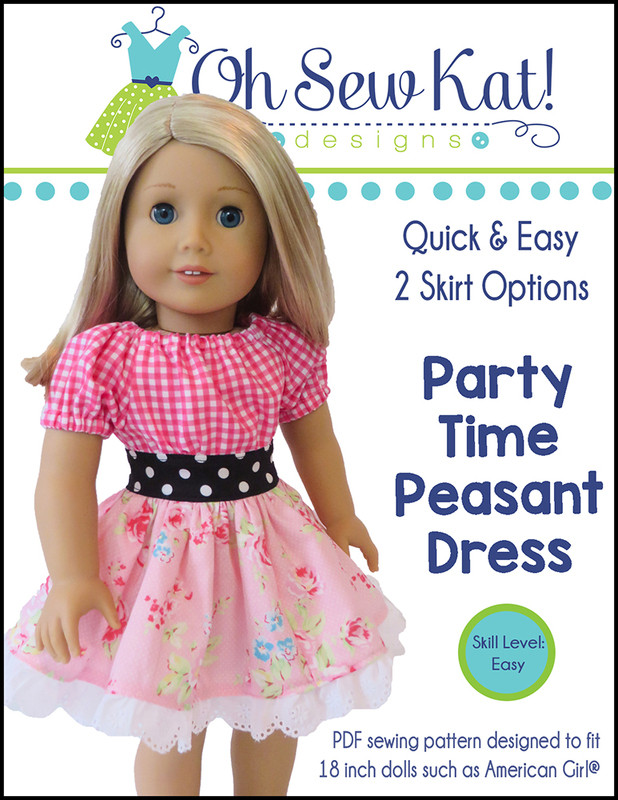 The School Dance Dress is a simple sewing pattern that will give your WellieWishers dolls a long sleeve dress to keep them warm in winter, but can also be used to move them into the warmer weather of spring with a sleeveless/shift version. Choose holiday fabrics for a festive look! Enjoy a few more tester photos of this pattern. Visit my Inspiration Gallery to see even more School Dance Dresses. Click here to download and sew your own School Dance Dress for WellieWishers today! March is the month of winter chills one day and spring blooms the next. 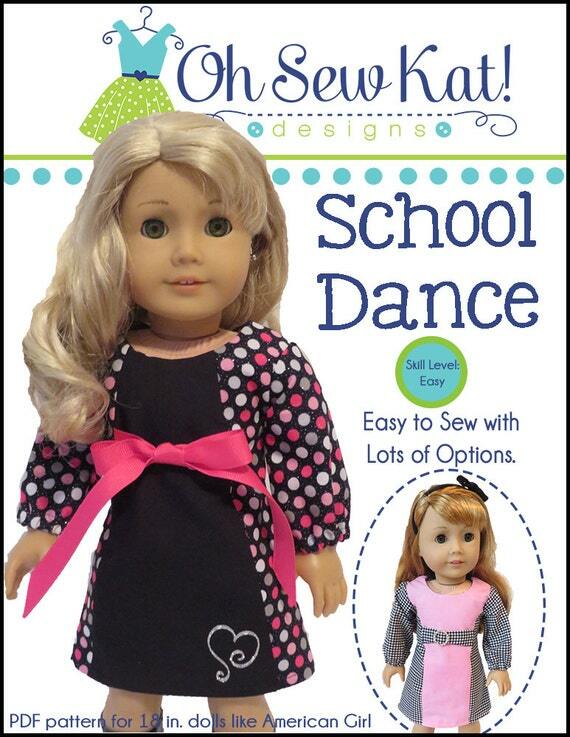 The School Dance Dress lets your doll be comfortable for both! Photo credits: Ashley Craw of SewandSoar, and Pam Ray of Amy Violet’s . 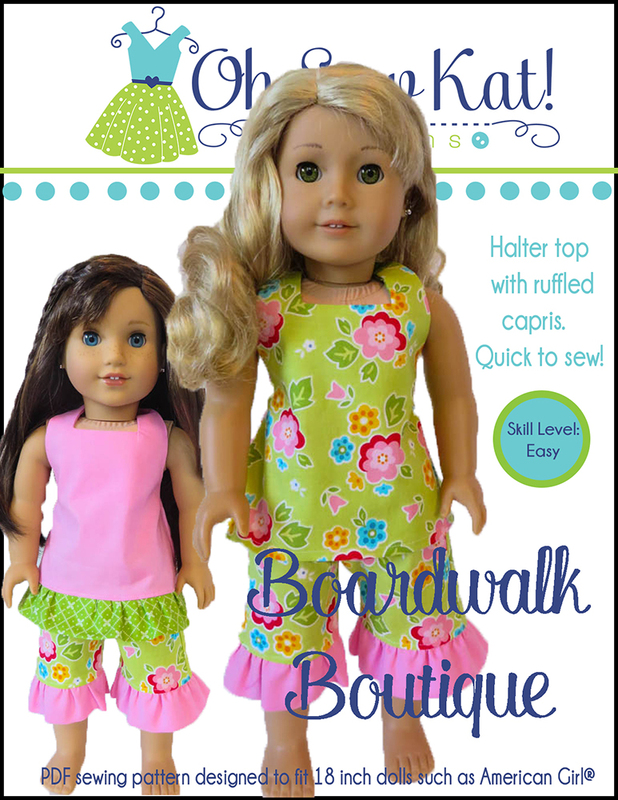 These amazing seamstresses sell their doll clothes, so be sure to bookmark their shops and check them often. The School Dance Dress pattern is also available for 18 inch dolls like American Girl and 16 inch dolls like Disney Animator Dolls in my Etsy Shop and on Pixie Faire. See more School Dance Dresses. 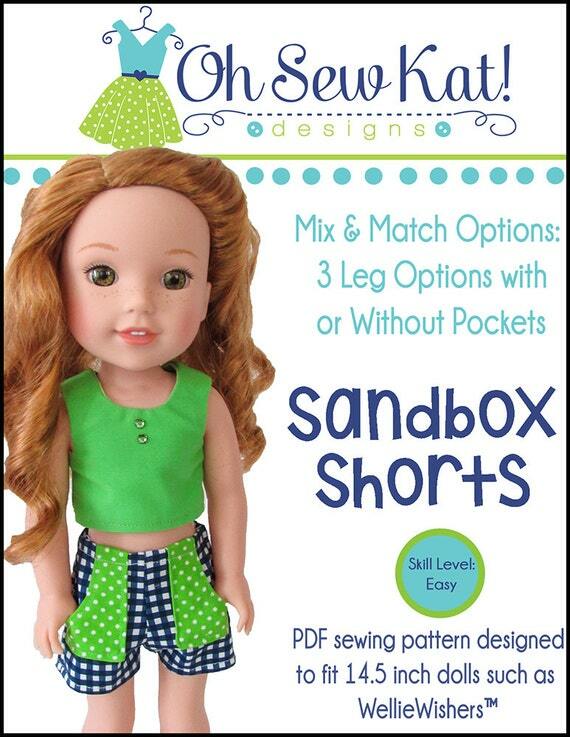 Here at Oh Sew Kat!, I offer patterns that are simple to sew and don’t take a lot of fabric. The sewing is shown in clear, step by step photographs to help even the newest and youngest seamstresses be successful. Those with more experience will also enjoy these patterns as a chance to use fun trims, fabrics and more to “style it up”. Here are a few more looks for Heart Day! 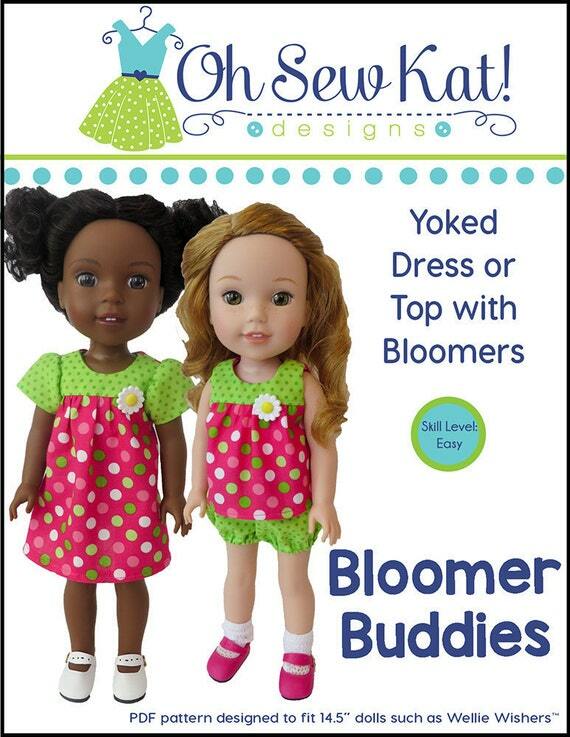 My patterns are offered in mutiple sizes to fit different dolls. Here are some WellieWishers dolls all ready for Valentine’s Day! Find these patterns at more at the following links. I sell my patterns where YOU like to shop so you can stay true to your favorites and collect applicable rewards points. Tester Tuesday! School Dance Dress for WellieWishers dolls. Today’s tester feature shows the beautiful work of Kel Pederson…of Nuclear Needle Arts. She is a productive woman, be sure to keep an eye on her shop which is always full of cute doll clothes! You can also find Kel at local craft shows. Visit her on Facebook to see more. Nuclear Needle Arts on Etsy. Kel’s Willa doll has a new hairdo- but her School Dance Dresses are perfect for the cooler weather.